ONYX Graphics has added support for both the Mimaki®JFX200-2513 and Mimaki JV300 series printers. The drivers, and twelve other Mimaki drivers, are now available for all ONYX Graphics version 11.1.2 rip and workflow software products. The JFX200-2513 flatbed printer is the smaller footprint model with the capability to print onto thick substrates; it facilitates thespeedy production of a diverse range of high quality prints for both indoor and outdoor use and is ideally suited for use in applications such as point of sale, double-sided displays, signs, interior décor, glass and metal panels and more. Its 2.5m x 1.3m landscape-oriented format is small enough to fit into most sign and graphic print shops while white inksand clear varnishoptions are available as standard. Furthermore, the UV-LED lamps offer reduced energy consumption and a longer lamp lifetime. The JV300 Series printers include newly developed printheads in a staggered configuration and inkjet technology with precise dot control that delivers higher productivity without sacrificing quality. The JV300 Series printers include eight ink channels and a variety of colours, such as orange and light black, to provide the flexibility to produce nearly any application. 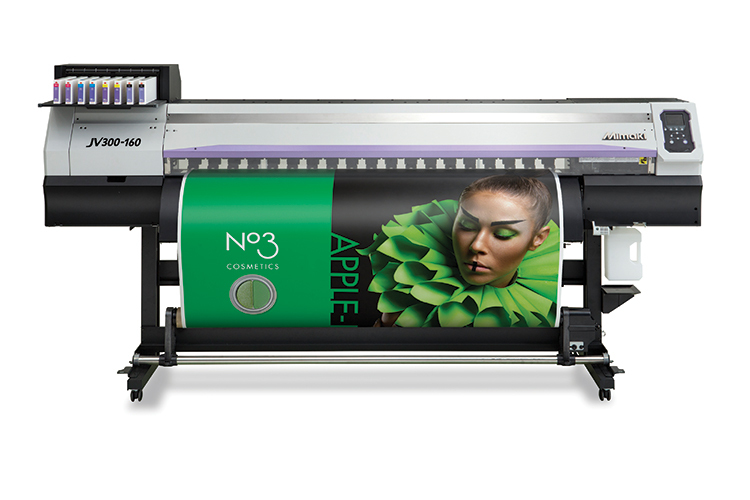 It uses fast-drying, eco-solvent inks that can print on hundreds of media choices for signage and graphic applications. Optionally dye-sublimation inks can be used for printing textiles, apparel and soft signage. ONYX Graphics recommends ONYX ThriveT print workflow software for the Mimaki JFX200 and JV300 series printers, which is a scalable solution based on Adobe PDF Print Engine technology nd enables users to achieve brighter, more vibrant images; reduce manual intervention and eliminate repetitive tasks. ONYX Thrive software includes network licensing and a production manager that enable users to customisetheir print workflow and easily grow with business demands. When using the Mimaki JV300 series printer with dye-sublimation ink for textile applications, the ONYX Textile Edition module for Thrive is recommended. Features such as Step & Repeat, Colorways and Ink Configuration Builder make this the ideal solution for all types of textile printing, including wall art and décor. ONYX Textile Edition software includes ONYX Color – Onyx Graphics’ proprietary colour engine. ONYX Color delivers an expanded color gamut that gives users the ability to match corporate colors, achieve deeper darks and print a wider range of colors. The Mimaki JFX200-2513 and JV300 printer drivers are available to registered licensed users of ONYX ThriveT version 11.1.2 print workflow software; and registered licensed users of ONYX ProductionHouse, ONYX PosterShop and ONYX RIPCenter version 11.1.2 RIP software. NextBag a CJV150-75 at a bargain price!